I’ve been a happy owner and user of a Nexus 4 for about two years (and the Nexus S before that), but in the last few months, my phone was starting to show its age. I was barely getting a full day’s usage out of the battery and after the Lollipop updates, things seemed generally more sluggish in general. It was time for an update, and following my usual habit of a skipping at least a generation when it comes to tech, I was really hoping to get a Nexus 6. Unfortunately, the $650+ price point placed it more than a little out of my reach. I’ve never owned a non-Nexus smartphone, but it seemed like it was finally time to move on to something else. There’s been a lot of hype and news about the OnePlus One that I won’t bother recapping here. In short, the OnePlus One is a reasonably priced, state-of-the-art Android smartphone that comes unlocked and runs a version of the CyanogenMod ROM. It’s not stock Android like the Nexus line, but there’s no bloatware either and it works just fine with the full suite of Google Apps and (as far as I can tell) most popular Android apps in general. After being invite only for several months, you can now buy one from the OnePlus website, but only on Tuesdays. I’ve had mine for about two weeks now and thoroughly enjoy it. Yesterday a friend of mine asked me about my experiences about the device. I thought I’d collect all the points I made in that conversation and share them here. For starters, I really like the device. It’s much snappier as compared to my Nexus 4, the large screen is gorgeous and the design in general is well executed. I got the 64GB “Black Sandstone” version. As the name suggests, the back of the phone has a black, sandstone-like texture that makes the device quite pleasant to hold. Time will tell if the texture holds up with daily wear and tear. The battery life is really good—I can easily get almost two days of moderate use on a full charge, and well over a day even with heavy usage. It’s really nice to know that I have a good few hours of usage left even if I forget to plug it in overnight. I was a little concerned about the large 5.5″ screen, which is pretty massive compared to smartphone screens I’m used to. However, after a few weeks, I’ve gotten used to it and it feels really comfortable to use on a daily basis. By and large, I can use it with one hand (even for input using the swipe keyboard), but it is definitely easier to use with two hands. In fact, the device is light and slim enough that compared to my Nexus 4, it actually feels lighter and less of a burden to carry around. I do a lot of reading on my iPad Air (RSS, websites and Instapaper) but I’ve barely used it over the last two weeks. I’ve been testing out the One as a tablet replacement, at least for format-independent reading, and it’s been working out quite well so far. I only have two main gripes about the One. First the CyanogenMod ROM that it’s using is still based on KitKat and I got used to Lollipop on the Nexus 4. But in all fairness, there’s nothing I seriously miss or can’t live without. And there’s a Lollipop-based ROM in the works. Second, the swipe keyboard seems noticeably less accurate than what I’ve gotten used to. However, that might just be because I still have the muscle memory of using the swipe keyboard on a smaller phone. In summary, I think the OnePlus One is currently the best option for an unlocked, reasonably priced smartphone, especially given how expensive the Nexus 6 is. I bought my first smartphone about a year and a half ago. It was the straight-from-Google version of the Samsung Nexus S, meaning that it came without any carrier-installed crapware and no contract. However, it was already over a year old and a generation behind the times when I got it. That meant that it was already slower than the current state of art and came with the older Android 2.2 (which I upgraded a few months later to Ice Cream Sandwich). Overall it was a good phone, but has been gradually showing it’s age. It was having trouble using newer apps and the upgrade to Ice Cream Sandwich had been awkward enough that I didn’t even try to update it to Jelly Bean. I had been using T-mobile as my carrier and though I had one of their contract-free prepaid Monthly4G plans, I had carelessly bought the version of the phone with the wrong radio chipset, meaning I only got EDGE service most of the time. The thought to upgrade to a new phone had been at the back of my mind for a few months. But the announcement of the Galaxy S4 as Google’s next flagship device made me take a look at the available options. While the S4 looks great, I wasn’t about to shell out $650 for a new phone. However, it turned out that the current flagship phone — the Nexus 4 — is available for $350 and it’s only a few months old. It was available unlocked and a quick search of the Intertubes suggested that it worked well on T-mobile’s network. The Nexus 4 is a good, solid device and is definitely a big step up from the Nexus S. The 1280 x 768, 4.7-inch display looks great, it’s slimmer and the 8MP camera is a much better than what the Nexus S. It also comes with Android 4.2 (Jelly Bean) and is fast enough to run heavy duty modern apps without skipping a beat. It doesn’t have LTE, but on T-Mobile’s HSPA+ network the speeds I do get are more than sufficient for my needs. The battery life is better than what I’m used to — I can generally end a busy day with about 15-20% to spare. Admittedly, I don’t stream a lot of video or upload lots of photos, so your mileage will probably vary. On my Nexus S I rarely installed apps and never really explored the Android ecosystem (or rather, the Google Play store). But with a newer phone with an up-to-date version of Android, it was time to go exploring. I was pleasantly surprised to find that Android apps seem to be developing a UI style that is quite different from the iOS counterparts (though not quite as different as Windows Phone). Apps from both large companies (such as Twitter) and smaller operations (like Astrid) sport a sharp, clean and mostly gradient-free design that I personally feel pretty refreshing. I also really like the Google+ app, though I can’t say I use it all that much and I’m looking forward to the new Gmail app. If you need more evidence that Android apps can be just as good looking as their counterparts on other platforms, check out Android Niceties. Sharing between applications and services is also so much nicer and painless than on iOS, though there are some bad apples (I’m looking at you, Feedly). 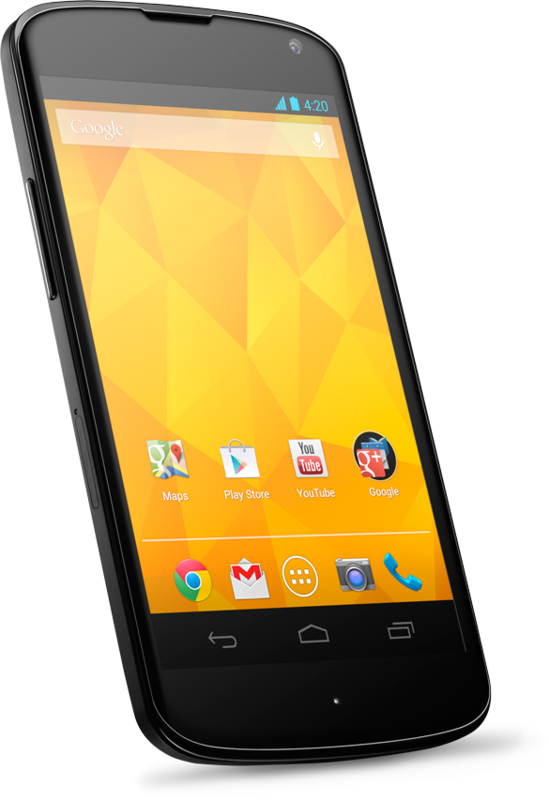 There are a few quibbles I have about the Nexus 4, but they’re not major and definitely not show-stoppers. For starters, the back of the phone is glass, not plastic or metal. I don’t have a history of breaking screens, but I will sometimes put down my phone pretty roughly on a table and I’m afraid I’ll end up cracking the back soon. Secondly, the headphone jack is on top of the phone. This is probably a good idea if you’re charging and listening to music at the same time, but makes it’s a bit awkward for listening on earphones with the phone in your pocket. With the Nexus S (which had the jack at the bottom) it was quite natural to put the phone in your pocket bottom-up and then turn your hand as you pulled it out to see the screen upright. The corresponding motion with the jack on the bottom seems rather more convoluted, but it might just be muscle memory that will get reprogrammed with time. Finally, (and this isn’t unique to the Nexus 4) I’m yet to find a Android to-do or task management app that is flexible enough as OmniFocus on OS X and Android. All that being said, I am very happy with the Nexus 4. I really liked the Nexus S when I first got it and I’ve always liked Android. The Nexus 4 is a significant upgrade and I pretty impressed by the current state of the Android ecosystem. Barring unforeseen problems (or a very cheap upgrade option) I fully expect to hold on to this as my primary mobile device for the next few years. I don’t have any experiences with other Android devices (or other smartphones for that matter) so I can’t really compare, but I’m willing to take a chance and say you can’t get much better than a clean stock Android (especially if you use Google services as much as I do). As a final happy ending, I managed to hand off my Nexus S to a friend who decided to move up from a dumb phone. That makes one less unused device for me to keep around. Good afternoon everyone. It’s fall in my part of the world, the leaves are changing color, the weather is getting colder and the days are getting shorter. Things are moving and shaking in the tech world (as usual) and today’s Selection takes a look at Microsoft, Linux, Firefox and the intersection of technology and life. Microsoft has a new website. No matter what you might think of the company and its products, I think you’d be hard pressed to say that the website wasn’t a job well done. It’s clean, effective and very modern. I’ve always had a soft spot for Firefox. Even though I mostly use Chrome nowadays, I keep coming back to Firefox. It was the first non-IE browser I used and I think the Mozilla team has done a lot to make the web a better place. It’s good see Firefox evolving and developing to stay in tune with the rest of modern technology. Linus isn’t the most public of technology superstars, but he doesn’t pull any punches either. In this recent Slashdot interview he talks about kernel development, what he might have done differently, patents and more. CreativeMornings is a monthly breakfast lecture series for creative types. Each event is free of charge, and includes a 20 minute talk. This one is by Jonathan Harris creator of We Feel Fine and Cowbird (among others). It talks about his journey exploring technology, life and storytelling. If you’re looking for examples of a remarkable life well lived, this one’s a keeper.